To answer this month's question, Brave Little State spoke with tribal leaders from Vermont's four state-recognized Abenaki tribes, or bands. Our story begins at an old cemetery in Brattleboro, up above a roundabout on Putney Road. The graves have old Vermont names like Fairbanks and Porter. It’s not a very peaceful cemetery - the sound of cars in the roundabout, and on nearby I-91, never ceases. 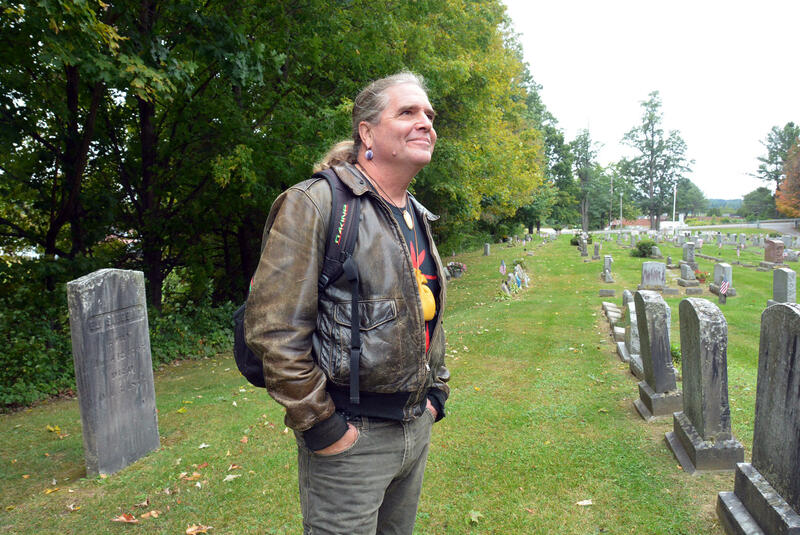 On a cloudy October morning, Rich Holschuh walks through the rows of headstones. 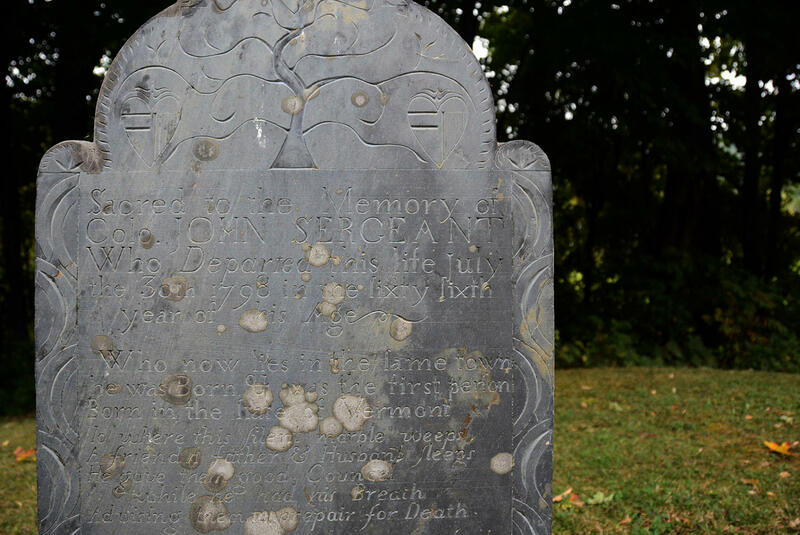 He stops at the grave of a man named Col. John Sergeant, a military commander who died in 1798. The gravestone of Colonel John Sergeant, the 'first person born in the State of Vermont,' in Brattleboro. “Let that sink in and realize what they’re saying there. They’re making a statement on purpose,” he says. It’s a statement that Holschuh wants to correct. He traces his heritage to the Mi'kmaq tribe in Nova Scotia — it’s part of the Wabanaki Confederacy, just like the Abenaki, who are here in Vermont. Holschuh is a member of the Vermont Commission on Native American Affairs, and it’s thanks to his efforts that Democratic Gov. Peter Shumlin proclaimed this year’s Columbus Day as Indigenous People’s Day. He wants people to remember that the Abenaki have been in this region for 12,000 years. In other words, just a few of them were born here before Col. John Sergeant. Rich Holschuh, who traces his heritage to the Mi'kmaq tribe in Nova Scotia, is on the Vermont Commission on Native American Affairs, and wants to help "re-right" the story of native history and culture in Vermont. “What made me curious about this more than anything else, was how little I have heard in the last 35 years, which is how long I’ve lived in Vermont, about them,” Bethany says. Bethany says she asked her question about Vermont’s Abenaki because they’re pretty much a total mystery to her. She says she heard a radio story once about how their language is disappearing, and she has some basic understanding of how colonization went. But on the whole, she has no good way of even placing the Abenaki in modern-day Vermont. And there’s another problem: Bethany says her children never learned about the Abenaki in school. She’s a former educator, and this lack of knowledge upsets her. Bethany wasn’t able to help report this story. But I figured the best way to start on her question was to ask it — that exact same question — to every Abenaki Vermonter I talked with. If you’re like Bethany and you know basically nothing about this subject, you might feel like, "OK, the Abenaki are still here. Why is that such a big deal?" And there are basically two big reasons. The first goes all the way back to the days of colonization, when Col. John Sergeant’s people came on the scene. “I call it the Great Puritan Lie,” says Chief Roger Longtoe Sheehan, of the Elnu Abenaki. Flat out denial that there was a permanent Native American presence in this region. This went on until very recently: In 2002 the Vermont Attorney General’s office said that the Abenaki didn’t have a “continuous presence” in Vermont because at one point they all migrated north to Canada. Here, Rich is alluding to the second reason that it’s a big deal that the Abenaki are still here: Starting in the 1930s, they were targeted by Vermont’s eugenics program. This was a very dark chapter in Vermont’s history. It involved coerced sterilization of the Abenaki — also French Canadians, poor people and disabled people. According to Nancy Gallagher, the author of the book Breeding Better Vermonters: The Eugenics Project in the Green Mountain State, the sterilizations plateaued around World War II, but by some accounts they went on for much longer. Don Stevens, chief of the Nulhegan Band of the Coosuk Abenaki Nation, he says what happened is still impacting the Abenaki psyche. So, for centuries there was denial of the Abenaki’s presence, and then persecution with eugenics. And then, about five years ago, a change. It came in the form of something called state recognition. 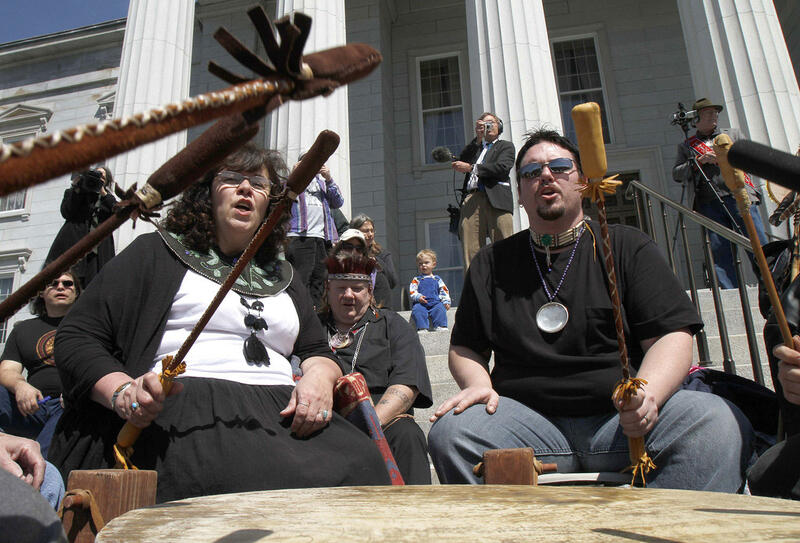 There was drumming at the Statehouse to celebrate when the Vermont Legislature and Gov. Shumlin acknowledged that the Abenaki did, in fact, have a continuous presence as a tribe in this region. This happened first in 2011, with the recognition of the Elnu Tribe of the Abenaki and the Nulhegan Band of the Coosuk Abenaki Nation, and again in 2012, with the recognition of the Abenaki Nation of Missisquoi and the Koasek Traditional Band of the Koos Abenaki Nation. There was celebration at the Statehouse in Montpelier on April 22, 2011, when Gov. Peter Shumlin signed bills granting state recognition to the Elnu Abenaki and the Nulhegan Band of the Coosuk Abenaki Nation. Amy Hook-Therrian, Shirly’s daughter and another member of the Council of Chiefs, adds: “People kept saying that there were no natives in Vermont and everything like that, and then finally it was like, ta-da! Yeah there are." So, to get an answer to our question about the status of the Abenaki today, I talked to tribal leaders about how things have been going since state recognition. Chief Roger Longtoe Sheehan, of the Elnu Tribe of the Abenaki, is proud of the work his and other tribes are doing to build unity and connect with the larger native community. But he says there isn't much awareness of a contemporary Native American presence in southern Vermont. The first person I met was Chief Roger Longtoe Sheehan of the Elnu Abenaki. The Elnu are the smallest tribe — about 60 members. Roger lives in southern Vermont, in the town of Jamaica, with his wife Linda and their two dogs. Linda is also cooking a massive Italian meatloaf, and it’s clear she is a culinary force. “This house is very tiny, and we’ve had, I’ve counted 24 people for dinner in this house,” she boasts. Their house is tiny, and Linda barely has to get up from the kitchen table to get some of the crafts she’s working on. Linda also does twining and works with wampum, which are beads made from clam shells. Roger makes stuff too. But they don’t have much on hand, because they’ve sold it all at pow wows and historical events. “It’s something that I do that is part of my history, but it’s also something that I love to do. Because my ancestors did it,” Linda says. Linda and Roger Longtoe Sheehan at their home in the town of Jamaica. Both are accomplished craftspeople, and sell their crafts at pow-wows and historical events. The sale of native crafts was actually one of the main things to change when the Abenaki got state recognition. Of all the tribal leaders I talked to, Roger thought this was the biggest deal. “Before we had state recognition, whenever we made something — a pipe, a wampum bracelet, whatever — and we sold it, we had to say that we were of 'Abenaki descent.' We couldn’t say that we were Abenaki from such-and-such a tribe. That’s a federal law. You could get hit with a $250,000 fine per item. So that’s why having that recognition counts,” he says. As for more informal recognition from folks in his part of the state, Roger says there isn’t much. “Down here, there’s a lot of people that are aware moreso of the history, but they don’t know that there’s actually a tribe here in southern Vermont,” he says. In Roger’s case, part of that has to do with the fact that he looks pretty white. 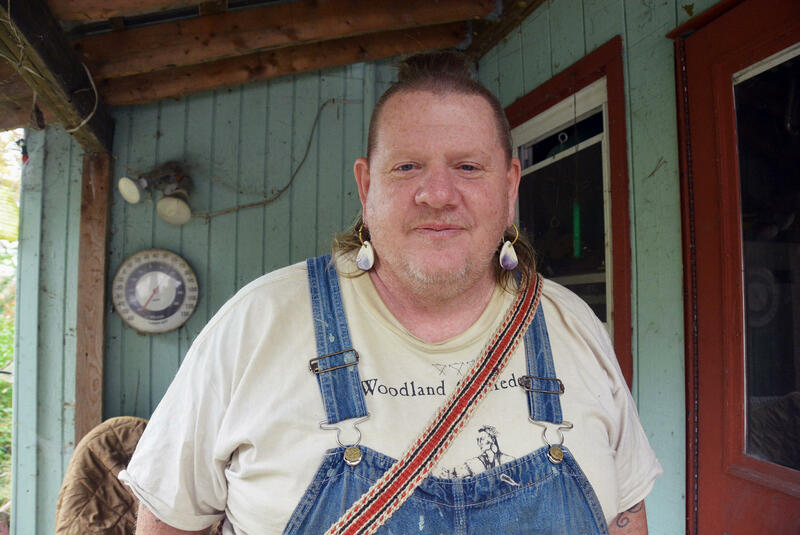 “The average Vermonter, because I’m so light-skinned, other than if I take off my hat and they see my hairstyle, the shaved head, maybe they’ll notice the tattoos, which are traditional tattoos, most of them just look at me as being Caucasian,” he says. There might not be a ton of awareness, but Roger says he feels good about the work his and other tribes are doing to build unity and connect with the larger native community. And he says things are much more open than they used to be, even in the generation just before his. "When I was in my late teens, I had my head shaved and my ears pierced and things like that. [My Uncle Jackie] gave me so much grief. I had to go get my driver's license, and he was like, 'They won't give it to you, they'll know you're an Indian,' and all this other stuff," Roger says. "Even in his age, he was still worried about it. I don't think it is so much now. Now he's in his seventies, and he's seeing all the stuff that we're doing, and that people ain't giving us a hassle about it." But Roger says this isn’t something he takes for granted. 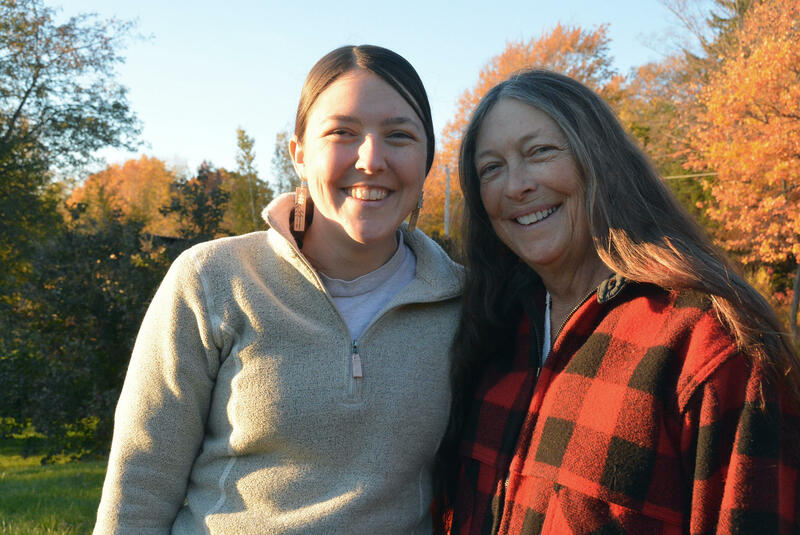 Amy Hook-Therrian and her mother Shirly Hook, members of the Council of Chiefs of the Koasek Traditional Band of the Koas Abenaki Nation, both speak of the profound sense of belonging they with their tribe and their heritage. When I visited Shirly Hook, I got to sample her jalapeno relish. Shirly is a co-chief of the Koasek of the Koos band — and her basement is full of enough pickled and canned veggies to weather the next Irene. “I’ve got relishes, shell beans, kidney beans, and all sorts of pickles down there," Shirly says. Shirly is such a prolific gardener that she has two gardens at her home in West Braintree. One is for growing the food that she eats and cans. The other is for seeds. There, she grows beans and squash and tobacco and other heritage Abenaki crops for a program called Seeds of Renewal. “It’s just to preserve them and to have them for further generations,” she says. Selflessness like this is the norm for Shirly: She’s helping raising money to restore the West Braintree Town Hall, and she also works with an organization called Hope on the Rise. It teaches women who are cancer survivors how to fly fish. “Mom’s always been definitely into making sure we do a lot of fundraising and everything like that,” says her daughter Amy, who is also a co-chief. After 9/11, when Amy was in elementary school, she worked with Fred Tuttle to raise money for New York police officers and firefighters. They got their picture taken at the Tunbridge fairgrounds and it ended up in People magazine. “We bought like a dozen copies,” she says. One of them hangs over a doorway in Shirly’s house. Shirly and Amy spent a lot time talking about this profound sense of belonging they have with their tribe and their heritage — especially Shirly, who spent 17 years researching her genealogy to confirm her native roots. “It was like, wow, I belong. I think that’s the thing, I belong,” she says. “It’s great that we call can say that we’re something different, but you always want to know what you are and where you come from, because it’s nice to have a place to fit,” Amy adds. There’s pride that comes with this sense of belonging. But Amy says you can’t always be public about it. “A lot of people think of natives as being like the John Wayne films ... darker skin, darker hair … And there's always this sense of people wanting you to prove it. Chief Don Stevens, of the Nulhegan Band of the Coosuk Abenaki Nation, sits at his home in Shelburne. 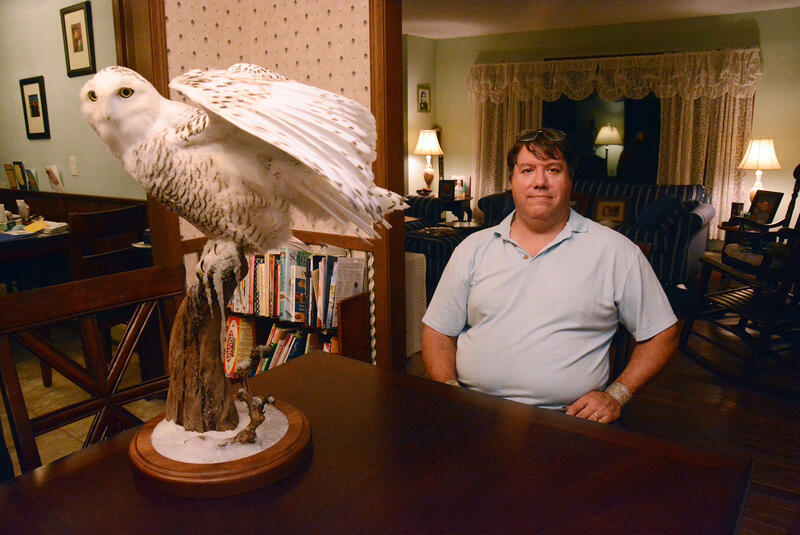 A snowy owl given to the band by Vermont Fish & Wildlife, which discovered the owl's body, sits on the dining room table, awaiting its permanent home. Shirly Hook says one way to deal with this ignorance is to prevent it by teaching about the Abenaki in Vermont schools. This is something almost everyone I talked to brought up, and it’s true that there’s no mandate from the Vermont Agency of Education when it comes to Abenaki curriculum. The agency leaves it up to the districts to decide if and how they teach it. This really bothers Chief Don Stevens, of the Nulhegan Band of Coosuk Abenaki Nation. He lives on a quiet street in Shelburne. When I arrived, he started apologizing for what a mess his house was — his wife was preparing a photo show with pictures from her world travels. By day, Stevens manages IT for the Counseling Service of Addison County in Middlebury. He conducts tribal business whenever he has a spare moment. Stevens has a long laundry list of things he’d like to help accomplish: He wants there to be a museum of native history, “or a place where people can go and get to know about who we are;” he wants the Abenaki to have representation in the state, so they can be a part of things like Lake Champlain clean-up; he says the Vermont Commission on Native American Affairs should have funding, so it can get more done; and he wants Abenaki history taught in Vermont schools. One thing Stevens doesn’t get political about is native identity. The most lit up and animated Stevens gets is when he talks about the Nulhegan tribal land, in Barton. 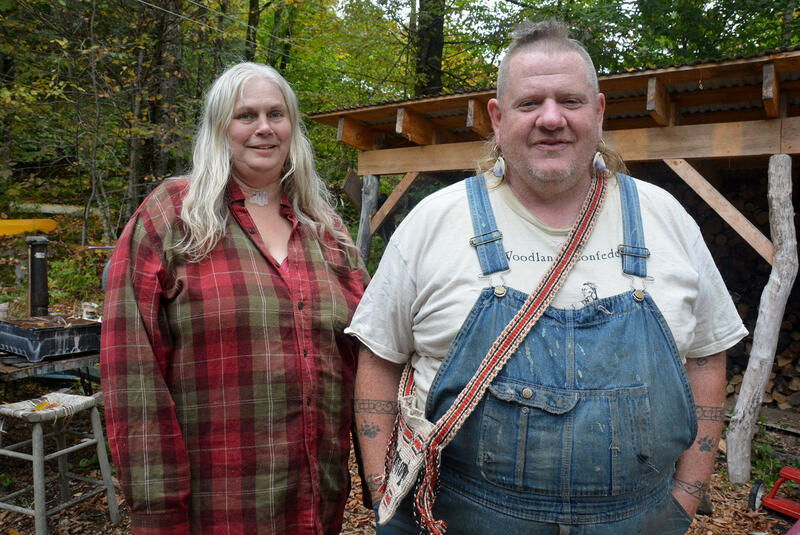 It’s 68 acres — they use it for maple sugaring and growing Abenaki crops. 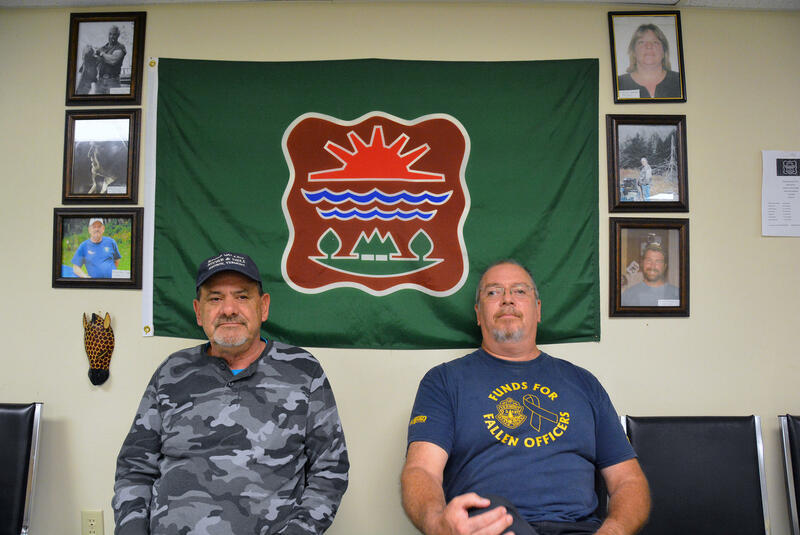 Chief Lawrence "Moose" Lampman and Eugene Rich, the co-chair Missisquoi Abenaki Tribal Council, sit beneath an Abenaki flag at the tribal headquarters in Swanton. Both say that it's important for Abenaki kids to see their flag displayed in their home state. Pride features pretty prominently in the future that Abenaki leaders are trying to create for their kids. It’s a new generation, that much further removed from the dismissal and stigmatism that plagued the Abenaki for so many generations. And to them, it feels like a turning point. The tribe is doing more community events, such as holiday meals and Taekwondo lessons. They’re also the only tribe really pushing for federal recognition. That would be a big step up from state recognition, with more opportunities for funding and other benefits. “I think there’s gonna be a brighter future for our children,” says Chief Lawrence “Moose” Lampman. Both he and Rich talked about how important it is for kids to see the Abenaki flag — a very literal symbol of pride — displayed in their home state. Rich told a story about going to his daughter’s graduation last June from Johnson State College. So Rich went back to his tribal council, and they packed up a flag to Johnson State, for next year. There’s no better way to groom the next generation than with some song and dance. Three times a week, a Title VII Indian Education Program in Swanton turns a basement space into an Abenaki drum circle. The after-school program, which is open to all, is called Circle of Courage. “Our teacher picks certain type of people to drum first or second or last, and we do certain types of songs, like candy dance and hunting,” Lana, one of the students, says. “When we tap our feet at the circle we can’t have our hands in the pockets, because they didn’t have pockets,” adds another student named Jasmine. Brenda Gagne, the instructor, has been running the program for 22 years. She clearly loves it, though she makes sure the students take the program seriously, perfecting their drumming technique (“Just your wrist!” she calls out between songs) and following the proper decorum. Gagne is doing her part to keep the Abenaki language alive, by teaching the kids basic vocabulary. And talking to her students, it becomes abundantly clear that the Abenaki are still here — and then some. Brave Little State has support from the VPR Journalism Fund, and Darn Tough Vermont. The Wabanaki Confederacy is an alliance of native American nations that first came together centuries ago. They meet regularly to renew ties of friendship and discuss issues facing the native peoples of a wide geographical region. From the shore of Lake Champlain in Burlington, a faint outline of a small, craggy rock formation is visible, nestled between Juniper Island and Shelburne Point. Its name is Rock Dunder and despite being a tiny blip on the Lake Champlain skyline, it has a deep significance in Abenaki mythology.